What with their Fiery Chicken Fries, Apple Watches, PewDiePies, and various and sundry Snapchats, today’s jaded schoolchildren are more difficult than ever to impress. What is a modern educator to do in such a disjointed, distraction-plagued world? “I make teacher raps for my students’ enjoyment,” reports one such pedagogue, Scott Swanson, who has his own modest SoundCloud account to attest to his claim. Scott, known professionally and musically as Mr. Swanson, has thus far only shared three tracks with the general public. Of these, two appear to be at least nominally educational in nature: “Google Maps Is The Best” and the Harry Potter-derived “Remus Lupin.” A third, the fiscally-themed “Money Speakin’,” is said to have been “written and performed by KingFro” and is less instructional in nature than the other songs but may nevertheless provide some insight into free market capitalism. “Google Maps,” meanwhile, joyously mashes up the Lonely Island’s “Lazy Sunday” with M.O.P.’s “Ante Up,” all in the name of geography. Swanson says of the track: “When we learn about a landmark or other interesting place, we will often use GoogleMaps and use street view to see how it looks now. I really enjoy it and the kids don’t seem to hate it.” In 2015, kids not openly hating a lesson must count as a victory. But it is the epic-length “Remus Lupin” which is truly Mr. Swanson’s magnum opus. Clearly, as a teacher himself, Swanson has mad respect for this lycanthropic Hogwarts professor. Over a beat which samples John Williams’ unforgettable “Hedwig’s Theme” from the Harry Potter movies, Mr. Swanson raps for a full seven and a half minutes about Remus Lupin, summarizing the plots of several of J.K. Rowling’s famed YA novels along the way, highlighting Lupin’s greatest achievements (“teachin’ kids important stuff, like dark art defense”), and even throwing some shade at some of the franchise’s unsympathetic characters, such as calling Draco Malfoy’s dad a “hater” and Malfoy himself a “hypocrite.” A humble suggestion to Mr. Swanson’s students: David Thewlis, the renowned English actor who portrayed Remus Lupin in five films, also lacks a hip-hop tribute track of his own. 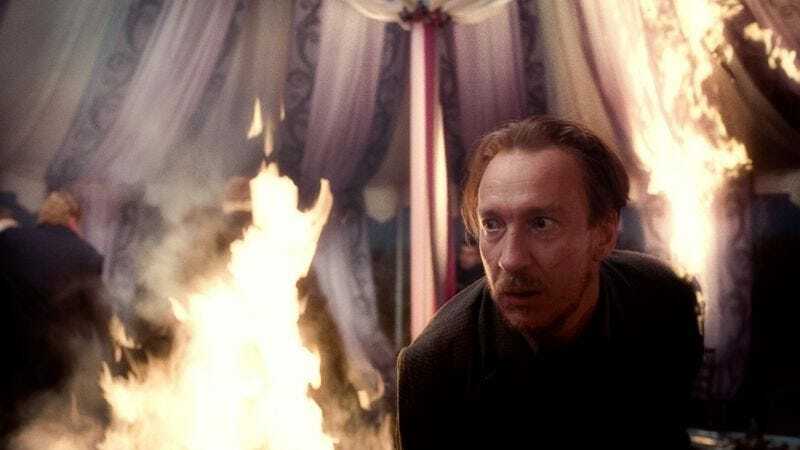 Since the actor’s name has the same cadence as that of his character’s, doing a “Weird Al”-style parody of “Remus Lupin” should not be difficult.